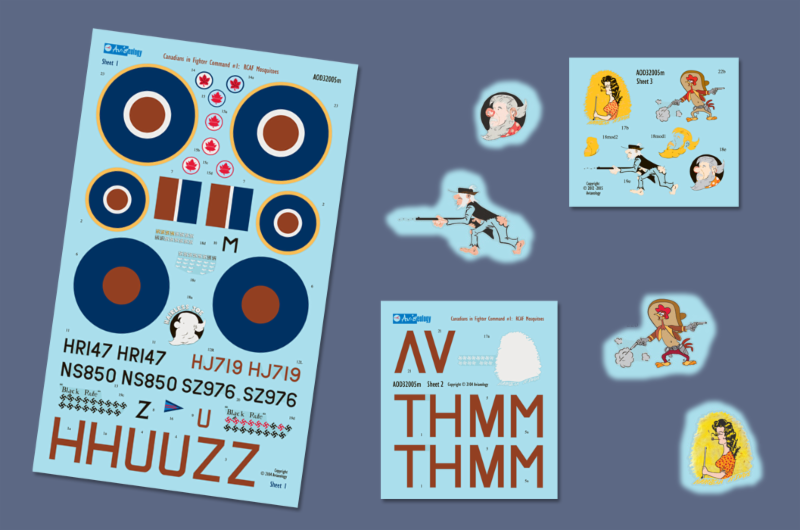 The Modelling News: New decals and stencils for your Tamiya Mossie and others from Aviaelolgy..
New decals and stencils for your Tamiya Mossie and others from Aviaelolgy..
Not sure of a decal choice for your new Tamiya Mosquito? 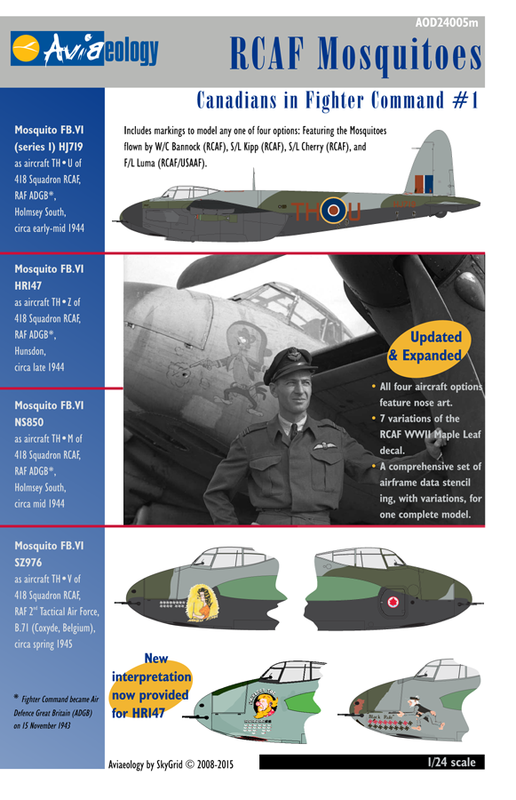 Canadian decal makers Aviaeology present great decal and stencil solutions for the Fighter bomber variant as well as a host of new decals on a cheaper Pre-Order price if you get in before May the 2nd – check them out in our preview…. 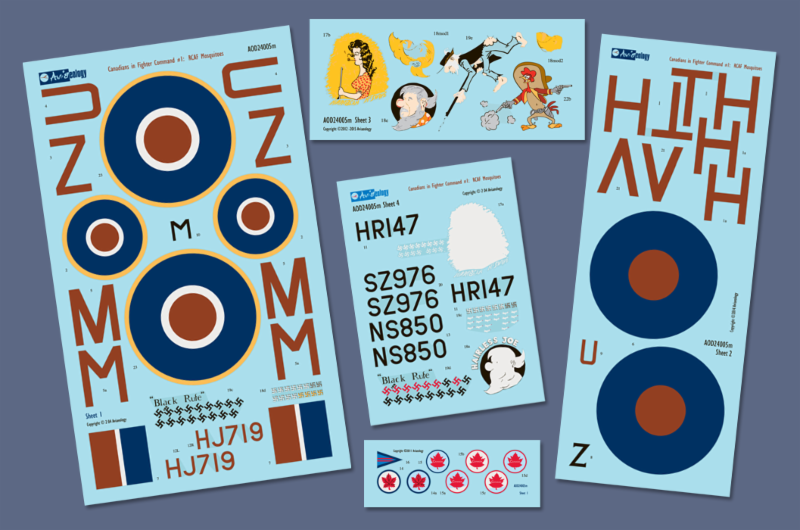 Aviaeology’s new decal releases + Pre-Order special..
Up on offer today are the new larger scale editions of the two popular Aviaeology Mosquito Decals 'n Docs sets (already been available in other scales), plus new airframe stencil data sets to complement them. These can be pre-ordered at a shipping discount from now until May 2nd. As usual all pre-orders will be shipped in date-of-order receipt priority. All of the above sets are expected to arrive from the printers within the last week of June - first week of July time-frame. Shipping will commence within a few days of arrival. 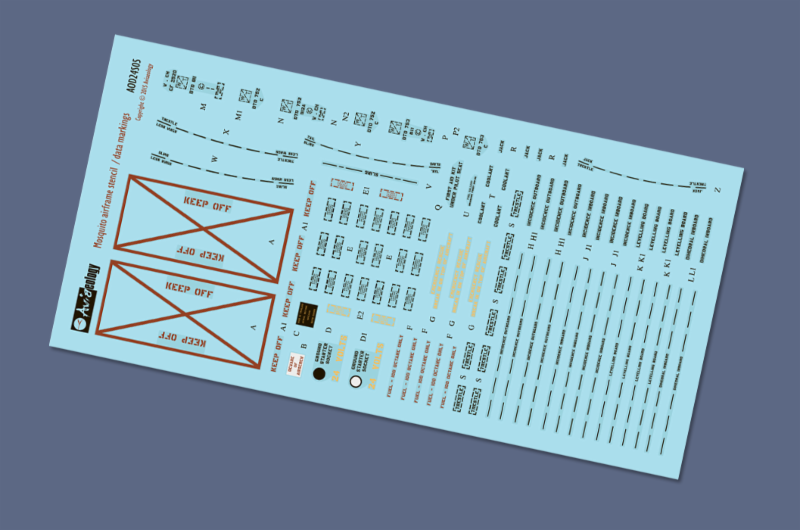 All new sets will "go live" in Aviaeology’s e-shop after the initial pre-orders and standing orders have been shipped. All pre-order links below are handled securely via PayPal. You can use either an existing PayPal account, or a credit card to order. 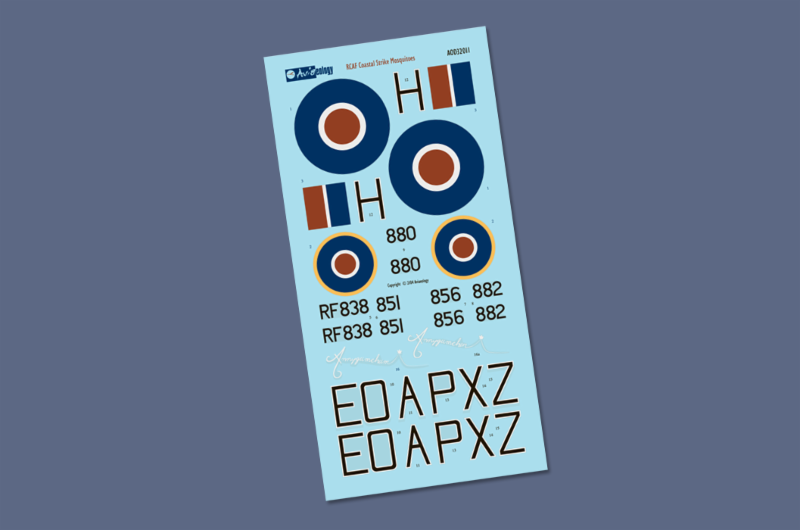 Meanwhile new Hurricane Nightfighter / Intruder and Spitfire airframe stencil / data markings sets are available immediately in Aviaeology’s eBay web shop (scroll to the bottom of the page for the links to these). * Mosquito FB.VI HJ719 as aircraft TH*U, "Moonbeam McSwine", F/L "Lou" Luma (USAAF) and F/O Colin Finlayson, Holmsey South, early-mid 1944. * Mosquito FB.VI HR147 as aircraft TH*Z, "Hairless Joe", W/C Russell Bannock and F/O Robert Bruce (RAF), Hunsdon, mid-late 1944. * Mosquito FB.VI NS850 as aircraft TH*M, "Black Rufe", S/L Robert Kipp and F/O Peter Huletsky, Holmsey South, mid-1944. * Mosquito SZ976 as aircraft TH*V, "Amigo Panchito", S/L Vic Cherry (a Texan in the RCAF) and various navigators, Coxyde, Belgium (2 TAF airfield B.71) and Volkel, Netherlands (2 TAF airfield B.80) spring 1945. In these new iterations of RCAF Mosquitoes, Aviaeology’s have taken the opportunity to introduce reconsidered interpretations of the "Hairless Joe" nose art - specifically the colour of the character's hair, and whether or not he had a "comb-over". Due to the legacy of the original artwork in previously released versions of this set, the mottled grey hair still remains, while the new colouring and "comb-over" are handled with overlay decals. The set's Docs have been updated accordingly. 1/72 and 1/48 scale modellers are also taken care of. Registered owners of these smaller-scale sets wanting to model the latest interpretation of the "Hairless Joe" artwork should send in a return-postage prepaid, self-addressed envelope to receive the overlay decals and updated Docs. Claims for which there is no corresponding ownership registration in Aviaeology’s system will not receive a response. In addition to the usual decal placement guide for each subject aircraft, the Docs portion of this package features photographs of each aircraft, configuration and detailed finish scheme notes, and an illustrated article on modelling the wing bomb ordnance as it evolved on Intruder-tasked FB.VI's. As usual in these Aviaeology Decals 'n Docs packages, a B&W hardcopy is included in the polybag with the decals, and a full colour PDF is emailed once your order has shipped. Pre-orders will be shipped in date-of-receipt order, commencing late June - early July. * Mosquito FB.VI RF838 as aircraft EO*A, "Anygumchum", 404 Sqn's first Mosquito to be delivered. * Mosquito FB.VI RF851 as aircraft EO*H, as flown on 404 Sqn's first Mosquito operation. * Mosquito FB.VI RF882 as aircraft EO*Z, features a variation of the Coastal Command Special Duties Scheme A. * Mosquito FB.VI RF856 as aircraft EO*P, 404 Sqn commanding officer, W/C "Teddy" Pierce's personal aircraft. Confirmed flown with both standard 50gal tanks and 100gal tank + rockets Coastal Fighter configurations. * Mosquito FB.VI RF880 as aircraft EO*X, 404 Sqn commanding officer, W/C "Teddy" Pierce's other Mosquito flown on operations. This one in the same scheme as RF882 above. 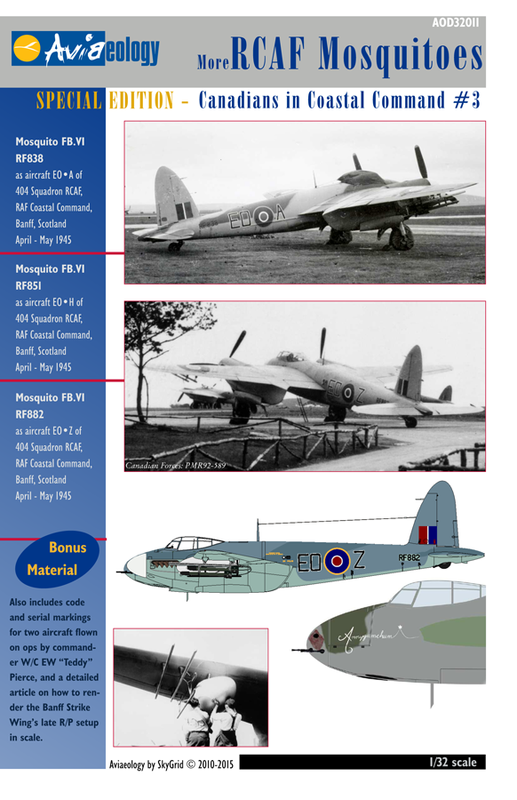 In addition to the usual decal placement guide for each subject aircraft, the Docs portion of this package features photographs of each, configuration and detailed finish scheme notes, and an illustrated article on modelling the correct rocket projectile armament configuration for very late war Coastal Command Mosquito FB.VI's. As usual in these Aviaeology Decals 'n Docs packages, a B&W hardcopy is included in the polybag with the decals, and a full colour PDF is emailed once your order has shipped. 1/24 scale modellers should note that the larger scale edition of this set is still available in very limited quantity (less than 20 as of this writing) and is available on our eBay store here. This set provides the usual thorough Aviaeology coverage, complete with variations on some of the common markings as discovered during research. Detail you big-scale Mosquito fully and completely. 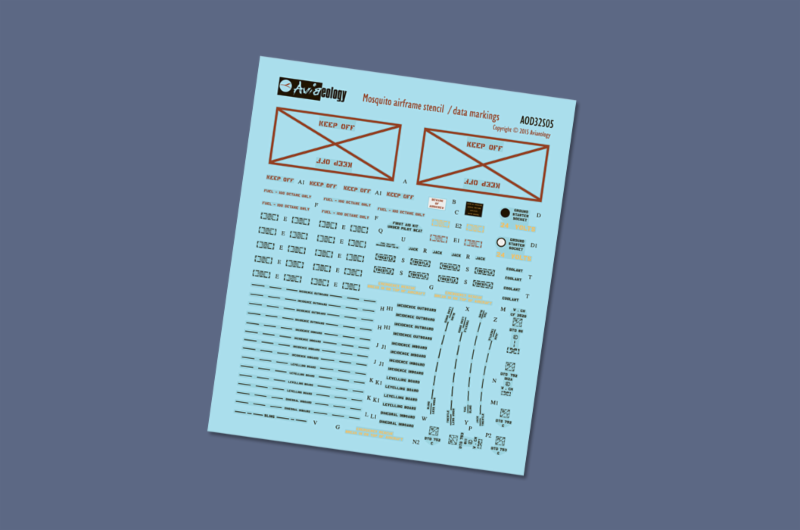 The 1/24 scale set takes up a full-height decal sheet! Although designed as a result of the research done during the work-up of Aviaeology’s Mosquito FB.VI Decals 'n Docs sets, and therefore optimized for gun-nosed Mosquitoes, with the possible exception of the nose area, most of the markings supplied here are also fully compatible with bomber nosed versions of the aircraft. *Also available in the AOD24005s RCAF Mosquitoes combo pack (reduced overall price) offered above. *Also available in the AOD32005s RCAF Mosquitoes and AOD32011s more RCAF Mosquitoes combo packs (reduced overall price) offered above. All of these sets are available immediately in Aviaeology’s eBay webshop. Just click the links to view details or to purchase. Orders for multiple sets are usually overcharged for shipping by eBay's automatic shipping calculator. Should you check out with this overcharge as applied by eBay, the overcharge will be refunded when we process your order. To avoid this additional step, you may wish to wait for us to send an invoice for your order prior to transacting payment.